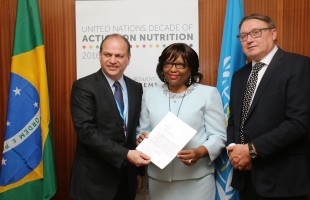 On the first day of the Seventieth World Health Assembly, Brazil became the first country to make SMART commitments as part of the United Nations (UN) Decade of Action on Nutrition 2016–2025. Ricardo Barros, Minister of Health of Brazil, made the announcement at a ceremony in Geneva. The commitments were welcomed by Dr Oleg Chestnov, WHO’s Assistant Director-General for Noncommunicable Diseases, and Dr Carissa Etienne, Director of the Pan American Health Organization (PAHO) the Regional Director for WHO in the Americas. Dr Oleg Chestnov, WHO’s Assistant Director-General for Noncommunicable Diseases. Currently, noncommunicable diseases are the cause of more than 70% of deaths in Brazil. Overweight and obesity are major risk factors for noncommunicable diseases such as heart disease, stroke, diabetes, and some cancers. Brazil outlined specific policy measures it will take to achieve these goals. These include fiscal measures (tax reductions, subsidies) to reduce the price of fresh foods, microcredit loans to family farmers, and cash transfers to poor families so that they can buy fresh produce.